Three members of Lebanon's militant Hezbollah group died of wounds sustained while fighting for control of strategic Syrian town near the Lebanese border, the Britain-based Syrian Observatory for Human Rights said Tuesday, as the battle in the area raged for the third straight day. Dozens of people, mostly combatants, have been killed in ongoing battles for the Syrian town of Qusayr, as Hezbollah sent new elite fighters to the rebel stronghold. Meanwhile, in northern Lebanon, new shells launched from inside Syria injured nine people, an official said. “Hezbollah has sent new elite troops to Qusayr. They have already taken many prisoners from among the rebels, including non-Syrians,” a source close to Hezbollah told AFP on condition of anonymity. “The rebels are putting up a fierce resistance, refusing to abandon the civilians,” he said. “But Hezbollah and the loyalist army are staging an extremely fierce assault,” he added. One activist, Tareq Murei, said rebel brigades in the north and west of Qusayr were trying to repel the latest attacks, in which three residents had been killed, bringing the number of rebel and civilian deaths in the last 48 hours to more than 100. 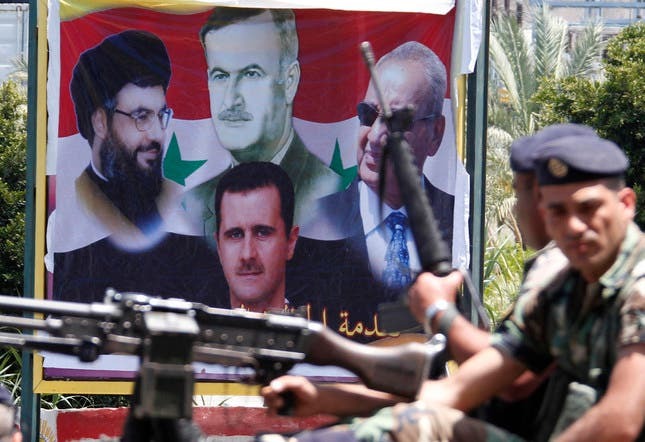 Syrian state media have said President Bashar al-Assad's forces had reasserted control over most of Qusayr, but Murei said the army-Hezbollah offensive had been ineffectual. According to Reuters, opposition sources say rebels have been preparing theirdefences for months, setting booby-traps , mines and roadside bombs to counter armored assaults and Hezbollah jeeps. At least 40 Hezbollah fighters were killed in the Syrian town of Qusayr late on Sunday, sources told Al Arabiya, following clashes between Syrian rebels and regime forces who attempted to enter the town earlier in the day. Sources also told Al Arabiya that tens of Hezbollah members were wounded during the fight and had been taken to hospitals in Beirut, Lebanon for treatment. The assault on Qusayr appeared to be part of a campaign by President Bashar al-Assad’s forces to consolidate their grip on Damascus and secure links between the capital and the government strongholds on the coast via the contested central city of Homs. State news agency SANA said the army had “restored security and stability to most Qusayr neighborhoods” and was “chasing the remnants of the terrorists in the northern district”. Hezbollah’s television channel broadcast images showing hundreds of people attending funerals for five members killed “carrying out their jihadist duty”. It did not specify where they had been killed. Meanwhile, sources said that Hezbollah official Fady al-Jazzar was reportedly among those killed. Al-Jazzar is considered to be a high ranking Hezbollah officer and was imprisoned in Israel until he returned to Lebanon in a prisoner-exchange deal. News on his death came after contact was lost with the group that was under his command, Al Arabiya TV reported.